Previous studies on the hazards and incidents correlated with thermal runaway in lithium-ion batteries have been studied by numerous scholars [1, 39, 40, 41]. The suspected processes which cause the thermal runaway in lithium-ion batteries are obscure even now and required to be researched thoroughly . Previous studies on the hazards and incidents correlated with thermal runaway in lithium-ion batteries have been studied by numerous scholars [1, 39, 40, 41]. The suspected processes which cause the thermal runaway in lithium-ion batteries are obscure even now and required to be researched thoroughly . To seek the physics or chemistry in relation to such uncontrollable reactions and to elucidate the phenomenon of the tremendous self-heat rate when a lithium-ion battery displays thermal runaway necessitate extensive efforts . The plot of pressure versus absolute temperature is capable of verifying whether decomposition or the runaway reaction is a vapour, gassy or hybrid system within lithium-ion battery . Our earlier works on thermal runaway of multiple 14,500 lithium-ion batteries, electrode materials and reaction chemistry between the elements of electrolytes have been investigated step by step by employing DSC and the restricted instrument to examine the obscure thermochemistry inside lithium-ion batteries [1, 42, 43, 44, 45, 46]. Four kinds of commercial E-One Moli 18,650 lithium-ion batteries were dynamically screened to thermal runaway under external heating in restricted settings in view of the tolerance limits of thermal abuses . In every sampled E-One Moli 18,650 lithium-ion battery, goals of safety-concerned elements in conjunction with the following points: (1) exothermic onset temperature, (2) adiabatic temperature rise, (3) enthalpy change, (4) maximal temperature, (5) maximal pressure, (6) maximal self-heat rate, respectively, could be corroborated under the abusive circumstances of thermal runaway . Through taking into account important temperature, maximal pressure, maximal self-heat rate in these lithium-ion batteries and maximal temperature, repercussions inferred from credible worst scenarios will be validated . Li-ion batteries consist a positive and negative electrode capable of Li+ ion insertion/de-insertion, and a separator; this separator is soaked with a lithium salt, which includes mixture of liquid organic solvents, to assure the rapid transfer of Li+ ions within the cell [2, 47, 48]. The electrode active materials, enmeshed in a mixture of binder  and conductive additive [50, 51], are coated on current collectors, where Cu foil (8–18 µm) is preferably utilized for Al foil (12–20 µm) for the positive electrode [47, 48, 49, 50, 51, 52, 53, 54, 55, 56, 57, 58, 59, 60] and the negative electrode [2, 56]. The negative electrode is forced to accommodate electrons from the positive electrode; these electrons flow via the external current circuit . Li+ ions, which are retrieved at the positive electrode side into the solution stage and migrate and diffuse via the bulk electrolyte to the negative electrode side, to assure the charge balance are inserted by the negative electrode . The negative electrode acts as the positive electrode as cathode and anode during the discharge process . Throughout charge and discharge of the LIB, the active Li+ ions are shuttled between two insertion host electrodes in the overall reaction of the LIB portrayed in Scheme . The positive electrode is named as the negative electrode as the anode and the cathode in the remainder of this manuscript and throughout the scientific literature . The groundbreaking cathode material of LiCoO2 where Li-ion can be lithiated and delithiated between cathode [61, 62] and anode had been created by Mizushima and Goodenough . Respectively, safety issue is apparently challengeable till now even after the first commercialization of lithium-ion battery, which employs, which SONY Co. announced, petroleum coke and LiCoO2 as anode  and cathode . Lithium transition metal oxides of LiNiO2, LiCoO2, LiMn2O4, LiFePO4 and LiNixMnyCozO2 have been most devised as cathode materials for commercial lithium-ion batteries [3, 64, 65]. The majority of the organic solvents in electrolytes responded with the released O2 or broken down on the surface of cathode materials to ignite exothermic runaway; this runaway might cause leakage, upsurge, or catch fire or rupture in case of thermal abuses . Trends of thermal stabilities in cathode materials utilized in commercial lithium-ion batteries need to be proclaimed or ranked in entire from the perspective of safety . Reactions of EC with eight cathode materials including LixCoO2, NiO2, LixNiO2, LixNi0.8Co0.2O2, Mn2O4, Lix Mn2O4, FePO4 and Co3O4, lithiated transition metal oxides traditionally utilized in lithium-ion batteries, are going to be implemented by confinement tests . Thermal runaway in a lithium-ion battery is always attributable to the most exothermic reaction, which cathode materials with electrolytes led . Phenomena or results on thermal runaway in EC and these delithiated cathode materials are validated to divulge the conflicts emphasised on the thermal runaway in lithium-ion batteries above 200 °C; these batteries are suspected from either anode or cathode apartment . Between the two electrodes, ions shuttle back-and-forth through liquid electrolyte (this electrolyte is made up of a useful lithium salt, including, dissolved in an suitable organic electrolyte) during operation . Porous separator sandwiched between two porous electrodes is contained by the cell . “Consider the discharge operation of this cell” . The ions produced at anode-electrolyte interface because of deintercalation will move toward cathode because of a combined impact of electric field-induced migration and concentration gradient-driven diffusion . Efficient operation of a lithium-ion cell rests on proper functioning of every of these transport mechanisms . The cell performance varies from its theoretical (thermodynamic) behaviour, which is given various geometrical configurations of operating conditions including multiple stages [4, 66, 67]. Mathematical modelling has demonstrated to be an appealing tool in governing Li-ion batteries examining the physics and helping us understand the behaviour of these cells . Established mathematical models for performance inferences of these cells, with useful instance simulations are described by the present chapter . Thermodynamic, transport, and kinetic, attributes of LIB constituent materials, the building blocks for performance analyses, are thorough first . In the above-mentioned model to clarify the non-isothermal operation of the cell, thermal impacts are integrated, as reasonably well . Deterioration of battery health could be attributable to two sets of events: (a) mechanical impacts-repeated intercalation/deintercalation gives rise to strain lowered effectiveness of the intercalation process and cycling of the electrode materials inducing damage, and (b) chemical impacts-highly reactive lithium metal responds with electrolyte to yield insoluble and/or gaseous commodities, inducing decrease in cyclable inventory . Cell failure can consequence from anomalous operation, i.e., under misuse conditions like thermal misuse [39, 68, 69], and overcharge, external short . Previous studies on the hazards correlated with thermal runaway happened in lithium-ion batteries were studied [5, 39, 40, 41]. The suspected processes which cause the thermal runaway in lithium-ion batteries are obscure even now and required to be investigated thoroughly . Explanations among the elements of cells or on the phenomena or results of thermal runaway in lithium-ion batteries are needed more discriminative studies . A entire cell is often introduced in an adiabatic calorimeter to examine the phenomena of thermal potential or runaway hazards in an 18,650 lithium-ion battery . Pressure in relation to absolute temperature is capable of verifying whether decomposition or the runaway reaction is a vapour, gassy or hybrid system in lithium-ion battery . Through restricted instrument to examine the misty thermochemistry inside lithium-ion batteries [42, 43, 44, 45, 46]. Thermal runaway of multiple 14,500 lithium-ion batteries, cathode materials responded with organic carbonates and lithium responded with electrolytes, had been efficiently carried out . Runaway under restricted settings, seven kinds of commercial 18,650 lithium-ion batteries are dynamically screened to excessive temperature in pursuit of thermal . Objectives of safety-concerned elements are aiming at the following points: (1) the important temperature in which the temperature will be accelerating or not returnable (2) average value of adiabatic temperature rise (3) enthalpy change in an 18,650 lithium-ion battery (4) maximal temperature could be reached under thermal runaway (5) maximal pressure (6) maximal self-heat rate . Through combining exothermic onset temperature, important temperature, maximal self-heat rate, maximal pressure in these lithium-ion batteries and maximal temperature, repercussions caused from credible worst scenarios will be validated . Lithium-ion batteries are compact, effective, rechargeable  and high energy . Under abnormal environmental conditions, the chemical contents of lithium-ion batteries might go via thermal runaway reactions . Such reactions are differing depending upon the kind of electrochemistry inside the lithium-ion battery . Upon the rupture of battery, fire or upsurge is subsequently triggered by the thermal runaway reactions . Little data exist concerning with upsurge response recommendations and battery fire since the rapid exploitation of high-power lithium-ion batteries into industrial and commercial applications . Use Evaluation and the Lithium-Ion Batteries Hazard had been published by the National Fire Protection Association to offer many research data of lithium-ion batteries fires [6, 71]. Some other scholars have carried out a set of fire experiments about single lithium-ion battery, and the state of charge (SOC) is regarded to be the principal factor of influencing the fires in these studies [6, 72, 73, 74, 75, 76]. Parallel and series connection is dangerous cause if one battery undergoes thermal runaway reactions and the other battery intends to balance the voltage or current, the system, which is destroyed maybe . When fire had been caught by one battery, it generates sufficiently heat to cause adjoining batteries to become thermally unstable as reasonably well . Heat propagation and the heating will also be various if the batteries pack is heated in various ways . The 18,650 lithium-ion batteries configurations inside the laptops maybe have a direct relationship with the fire accidents based upon the realistic consideration . This work carried out many experiments in Lhasa in order to investigation the burning variations of various configurations batteries fires . Lithium transition metal oxides (Li1+xNiyCozMnwO2, NCM with y + z + w = 1) of various composition frequently substitute the “classic” LiCoO2 (LCO) cathode material in nowadays’s lithium-ion batteries (Li-ion batteries) [7, 77]. The NCM stages, frequently denoted as next-generation cathode materials, indicate greater specific capacities because of the addition of nickel and have a lower price than LCO thanks to the content of manganese, whilst still maintaining satisfactory cycleability [7, 78]. A non-negligible contribution to capacity degradation results from gassing, i.e., from the decomposition of electrolyte elements into gaseous compounds, particularly at elevated temperatures . A thorough and systematic examination of these gassing mechanisms is unavoidable in order to observe an approach for the development of enhanced complete cells employing NCM cathodes . It is the result of electrolyte and/or electrode material oxidation at the cathode side due to the requirement for high terminal voltages . That the in situ identification of CO through quadrupole mass spectrometry in a gas mixture is not clear-cut, since CO2 modes molecular pieces that superimpose the CO spectrum is pointed out by us . The Ni-rich NCM523 stage is one of the main marketed NCM materials . In NCM523-based complete cells, we present a comprehensive analysis of the gassing phenomena . We indicate the longer-term cycling tests, the details of the first cycle, the gassing during a characteristic battery formation cycle, and the gases because of SEI formation . It is required to carry out an additional investigation on the thermal attributes of Li-ion batteries to have a better understanding of LIB safety . Under outer radiation, Wang and others  and Huang and others  examined the combustion behaviours of large-scale lithium-ion battery by assessing flame/surface temperature, flame topography and mass deterioration rate, heat release rate . Some experiments have been carried out to examine the effect of state of charge (SOC) on the fire behaviours of Li-ion batteries [8, 73, 75, 76, 81]. Under the help of cone calorimeter, Fu and others  and Chen and others  had taken experiments of Li-ion batteries with various SOCs (0–100%) and observed that LIB with greater SOC might owns greater fire hazards . Ye and others  evaluated the thermal behaviours of Li-ion batteries under power cycling with the help of accelerating rate calorimeter (ARC) and the charge/discharge cycle instrument under adiabatic condition . That the temperature rise or temperature rise rate increasing with the growth of circulation rate and the temperature of Li-ion batteries had been greater under discharge condition had been founded by Ye and others, . Scarce work examines the thermal runway of Li-ion batteries with various SOCs under discharging condition, particularly for the overcharge condition, and variations in the thermal fire and runaway behaviours of Li-ion batteries without discharging and with had not been examined . Cone calorimeter, as an crucial apparatus in the evaluation of combustible materials, has not been utilized to analyze the fire behaviours of Li-ion batteries under discharging condition . This work aims to examine the thermal behaviours of Li-ion batteries with and without discharge employing the cone calorimeter in order to fill in the disparity . Up to their full destruction, overdischarge, i.e., overreaching certain minimum allowable voltage region upon discharge of a lithium battery is regarded to consequence in the irreversible degradation of cathode materials . Overdischarge phenomena have been researched for batteries with LiCoO2 , LiFePO4, LiMn2O4 cathodes , and LiNiO2 . Say, a conclusion, which is drawn for cells with LiCoO2, cathodes  states that declining voltage to below than 1.5 V triggers no significant capacity losses . In the composition ranges of 0 ≤ x ≤ 0.5 and 0.5 ≤ x ≤ 1.0. In the composition ranges of 0 ≤ x ≤ 0.5 and 0.5 ≤ x ≤ 1.0, the reaction occurs in two phases the electrochemical intercalation/deintercalation of lithium-ions into/from the lattice happens at about 4 V, if the lithium manganese spinel LiMn2O4 is utilized as a cathode. though the spinel keeps its cubic structure (space group Fd3m, Z = 8) [86, 87, 88] with the lattice parameter a = 8.248 Å and the unit call volume V = 539.75 Å3 . That upon longer-term cycling, particularly at small overdischarge, the surface of LiMn2O4 particles enriches with lithium is emphasised by coworkers and Thackeray . That implies tetragonal Li2Mn2O4 arises, the Jahn-Teller reconfiguration, and finally Li2MnO3 and soluble MnO are forming via the disproportionation reaction [89, 90] as That means that upon longer-term cycling, a combined overdischarge and break-up impacts reshape the better part of electrode material from LiMn2O4 to Li2MnO3 reasonably well detectable in XRD researches . Another can conclude that overdischarge substantially increases the probability of its occurrence, and the formation of Li1+xMn2O4 in modern Li-ion batteries is a negative phenomenon . A crucial dimension in the application of Li-ion batteries (Li-ion batteries) with liquid, flammable and volatile organic solvent-based electrolytes [91, 92, 93, 94, 95] is safety . The analysis of organic electrolyte additives in LIB and organic carbonate solvents electrolytes through GC is reasonably well established . The majority of researches, revolved around the identification through utilized GC-FID or GC-MS for quantification and utilized organic solvents for the dilution of samples prior to liquid injection [10, 96, 97, 98, 99]. They, diluted their samples with the organic solvent acetonitrile whilst the organic carbonates dimethyl carbonate (DMC), diethyl carbonate (DEC), ethyl methyl carbonate (EMC) and propylene carbonate (PC) with limits of detection (LODs) in the variety of 11.7–31.7 mg/kg had been efficiently quantifyed by Grützke and others [10, 100]. Sloop and others [101, 102] firstly diluted LIB electrolyte solutions with water in contrast to most researches . The focus of this work had been the development of a quantification technique for the organic carbonates EMC, DEC, ethylene carbonate (EC) and vinylene carbonate (VC) in aqueous solutions of cell culture medium and cell pellet solutions incubated with commercial LIB electrolytes based upon a liquid-liquid extraction and subsequent analysis through GC-MS . The technique had been validated and utilized for the transfer across the blood-cerebrospinal fluid (CSF) barrier in a porcine cell culture model to gain more insights into the toxic impacts of these compounds and the analysis of the cellular uptake of organic carbonates in human lung adenocarcinoma cells . The transition metal intercalation oxides have induced the main research interests as the LIB cathodes since layered LiCoO2 had been firstly utilized as a cathode material for Li-ion batteries in 1991 . The traditional cathode materials include layered LiMO2 (M = Co, Ni, Mn) compounds [103, 104, 105], Li-rich materials , spinel LiMn2O4 , orthorhombic structure Li2MSiO4 (M = Fe, Co, Mn, Ni) compounds [108, 109], olivine LiMPO4 (M = Fe, Co, Mn, Ni) compounds [110, 111], and tavorite LiMSO4F (M = Fe, Mn, Co) [11, 112, 113]. The layered LiMO2 (M = Co, Ni, Mn) compounds have been the most intensively utilized and examined cathodes, though they suffer from greater cost (LiCoO2), toxicity (LiCoO2), thermal turbulence (LiNiO2), serious voltage decay (Li-rich material), systemic turbulence (LiNiO2), and serious security ramifications (LiNiO2) and (LiCoO2) . Several non-toxic polyanionic compounds including LiMSO4F, and LiMPO4, Li2MSiO4, have aroused interest for use as possible cathode materials in Li-ion batteries, though the inherent inferior electronic electrical conductivity and low ionic diffusivity, including the systemic turbulence because of Jahn-Teller distortion Li2MnSiO4, (LiMnPO4, and LiMnSO4F) restrict the practical application . Spinel LiMn2O4 is one of the most sought-after cathode due to low toxicity, its safety, and high thermal stability, though the meager high-temperature performance restrict its additional application because of the Jahn-Teller distortion of the structure . LiNi0.5Mn1.5O4 has been viewed as one of the most fruitful high-voltage candidate for lithium-ion batteries . It is required to observe suitable electrolyte systems to then exert the perfect electrochemical performance of LiNi0.5Mn1.5O4 material, and increase the stabilization of a LiNi0.5Mn1.5O4 cathode/electrolyte interface . “The stability of electrolytes at high voltages become a constraining factor for the development of LiNi0.5Mn1.5O4 electrode” . That becomes a primary concern for battery users, and consequently a non-destructive technique is needed to access the harmful effect of the overcharging in order to decide if one must change the cell from the safety and validity viewpoint . Whether one can pinpoint the internal elements in a cell that are most susceptible to excessive cut-off voltage COV, they can enhance their cells so as to make the cell more reliable against this misuse from battery manufacturers point of view . The degradation of every individual elements inside a cell could be dictated via its discharging curve (i.e., terminal voltage versus time during discharging) alone with the recent development of electrochemistry-based electrical (ECBE) model (Leng and others ), . The ECBE technique is utilized by us to analyze the effect of excessive COV on the degradation of every element experimentally . Gases formed in the sealed cells give rise to the buildup of internal pressure and swelling of the cell, de-contacting of the active material and hence present safety difficulties  and de-lamination of the electrodes . In an LIB that can sometimes be detected after the battery has been utilized for many time or after electrical misuse tests, a characteristic instance is the swelling . The swelling normally results from the reductive decomposition of the electrolyte on the negative electrode; this electrode gives rise to excess pressure within the cell [13, 116]. Gas bubbles on the graphite electrodes in LIB cells employing in situ neutron image analysis  were detected by Goers and others . Such authors did not carry out experiments to examine the traces of gas bubbles generated in the process of disassembling the cell or inside the disassembled cell . In dry rooms, Commercial LIB manufacturers usually assemble batteries to lessen the moisture within the cells . The wound cell is positioned in a foil pouch or an aluminium body case, and linkages are made between the external battery terminals and the electrodes . The link between the swelling of those batteries during their cycle life and the generation of gas bubbles in prismatic batteries during longer-term storage has not been indicated yet . Throughout longer-term storage, which employs cell disassembly analysis and CT, the electrode deformation phenomena of cells and the initial generation of gas bubbles had been examined by us, and we carried out a failure analysis on the swelling that happens during the lifecycle of the battery such as longer-term storage . Due to its well-established advantages, i.e., high theoretical capacity (roughly 170 mAh g−1), low cost, useful lithium-ion insertion/extraction potential (roughly 3.45 V vs. Li+/Li) [111, 118, 119], and low toxicity, olivine-type lithium iron phosphate (LiFePO4) electrode has extensively aroused attention . The well-established combination of the positive electrode of LiFePO4 in lithium-ion battery and negative electrode of graphite are one of the most fruitful candidate power sources for electric vehicle [14, 120, 121]. A complex set of interacting mechanisms is Lithium-ion battery ageing . A variety of various ageing processes for lithium-ion batteries have been devised, such as deterioration of electrolyte, separator, active materials, and composite electrode structure, including evolution of solid electrolyte interphase (SEI) [14, 122, 123, 124]. Post mortem analysis confirmed the break-up of Fe2+ from the LiFePO4 electrode and its subsequent deposition on the carbon anode; this anode acts as a catalyst that accelerates the formation of SEI layer and continually consumes active lithium . Through employing multiple methods, such as destructive analyses on internal materials [125, 126, 127] and nondestructive electrochemical techniques, taking into account the wide range of processes contributing to the ageing of lithium-ion batteries, we diagnosed battery ageing . Electrochemical methods, including galvanostatic cycling at differential capacity and differential voltage analyses [128, 129, 130, 131, 132, 133, 134, 135] and various rates [136, 137], offer an evaluation of kinetic deterioration, which results from increase in resistance, and low-rate capacity deterioration . Destructive techniques, such as half-cell test, scanning electron microscopy (SEM), and X-ray diffraction (XRD), were carried out to additional clarify capacity fading . Spent LIB are rich source of useful metals like lithium, cobalt, manganese, nickel, aluminium, copper, etc. . Several chemical and physical mechanisms have been indicated which comprises crushing, dismantling, sieving, electrochemical techniques and chemical precipitation to effectively recover the useful metals . Through employing separation and chemical precipitation, alkaline or acidic leaching is undertaken for extraction of useful metals in hydrometallurgical process . In the scientific literature, it is indicated that the leaching efficiency of the useful metals employing the strong acids lies in the variety of 85–99% [138, 139] while for weak acids lies in the variety of 70–99% [15, 140, 141]. Leaching efficiency comprises of efficiencies of all the steps incurred in extraction of the useful metals . Extractions of useful metals from the spent lithium-ion battery comprise of three principal steps, viz. (1) peeling of active cathode materials from the cathode (2) electrode break-up of active materials into the acid (3) and extraction of useful metals from the dissolved active materials employing chemical precipitation . The high efficiency of these steps eventually results in high recovery of useful metals . Whether high purity of retrieved metals is accomplished then those metals in the form of oxalates or carbonates could be combined to form the active cathode material for consequently overexploitation rate from global reservoir of these metals could be lowered to many extent and manufacturing of cathode of the lithium-ion battery . The cobalt oxalate is retrieved employing precipitation technique at the optimum operating condition with effective technique with high purity . An experimental parametric investigation to evaluate the thermal attributes of heat pipe cold plates (HPCPs) for lithium-ion cell/pack with numerous cooling methodologies and various charge rates had been carryed out by Ye and others [16, 142]. The excellent thermal performance of heat pipe, which is premised BTMSs primarily on the cooling effect at constant charge/discharge rate with various configurations, had been shown by the above pertinent studies . Given the miniaturization and compaction of the cooling/heating device to satisfy the requirements on arrangement and optimum structure in EVs, the advantage of heat pipes’ bi-directional feature must be completely employed for high-efficient heat pipe BTMS and a well-design to offer not just satisfactory cooling effect at high temperatures though also excellent preheating performance under low temperatures . The principal contributions of this work are developing such a small sized heat pipe and presenting its application to a BTMS with both cooling and heating, and then the experimental temperature attributes of UMHPs could be carried out to guide thermal analysis and optimization of heat pipe BTMSs . This chapter explains an UMHP BTMS for a lithium-ion battery pack, which is utilized in EVs; and introduce an experimental setup established for thermal assessment of the UMHP pack; then the cooling performance of the UMHP pack is assessed under constant discharging conditions and transient heat inputs on the federal urban driving timetable (FUDS) highway condition, and two preheating techniques by sticking (1) on the surface of cells, heating films and, (2) on the fins of UMHPs are compared to evaluate the heating efficiency under subzero temperatures in this chapter; finally, numerous conclusions are drawn . That well-established statistical techniques, e.g. the log-linear model , characterize satisfactorily the link between the design parameters [144, 145, 146, 147] and the battery life-time had been demonstrated by some researches . Owing to the huge number of contextual factors engaged, some problems persist to solve the issue of the battery size optimization over a prefixed time horizon of interest . Cycle life (CL, as assessed by the charge-discharge cycles), or battery life-time, depends upon some parameters, including design maximal specific power, operating environment, depth-of-discharge, etc. [17, 148]. In real operating conditions, the randomness of the above parameters, reliable techniques to examine these dependences are required, since these uncertainties might cause significant differences in cycle-life estimation, so that huge variations are detected between the battery CL, which is supposed experienced and, as exhaustively demonstrated in a number of experimental works [149, 150, 151] by taking into consideration . A number of researches, which is based upon stochastic technique for calculating the likelihood distributions of the battery life-time, have been lately dedicated to observe accurate solutions to such an issue . With a proper stochastic input, had been devised for deducing the battery life-time, adopting a probabilistic strategy, based on an extension of the (deterministic) Virudhula and Rakhmatov battery model [152, 153] in  an advanced battery model . In  the devised probabilistic technique has been utilized to the design of lead-acid battery modules . The technique enable to conceptualize battery module parameters that assure, with a high extent of likelihood, that the CL is greater than a prefixed value by stemming the time-to-failure probabilistic density function from a statistical analysis of experimental data . Battery models are a crucial element of a dynamic electric vehicle simulator [18, 156]. It is hence required to build battery models; these models precisely imitate real battery attributes . The models should be fast, highly reliable, straightforward, should imitate the attributes that conceptualize a battery and less memory intensive . Battery models that are included in EVs/HEVs should be capable of reliably predicting SOH and the SOC to enhance the validity of the vehicle . In considerable detail, electrochemical models [157, 158, 159] characterize the battery chemistry making these models highly reliable . Such models seem to become too complex as a set of partial differential equations describing diffusion phenomena and the ion transport, mass and charge balance, temperature and ion distribution impacts have to be resolved to observe the behaviour of battery . Both models depend on the high-level representation of battery with analytical expressions based upon physical regulations . Such models are useful and computationally complex for predicting just individual behavioral facets of the battery . Complex impedance network is utilized by these models to match the battery ac response . The ability of these models to match the complex transient attributes of the battery is restricted, as reasonably well . Such models are misleading and considerably complex in predicting battery attributes . The focus of this work is modelling the steady-state and transient behaviour of battery, which employs Thevenin-based circuit model . The transient I-V and steady-state performance of battery is persuasively replicated with the model . Battery internal voltage, which is constituted as CVS, is experimentally demonstrated to be various from OCV and it is modelled as a function of SOC . Commonly utilized battery models include electrochemical models  and equivalent circuit models . Following the dynamic attributes and working principles of batteries, the equivalent circuit model is devised employing resistors, voltage sources, and capacitors, to form a circuit network [19, 161, 162]. A straightforward model is normally reluctant to reflect all the dynamic impacts of a battery, which might consequence in errors in the identification of parameters; hence, the precision of the equivalent circuit model must be enhanced [19, 163]. The electrochemical model of a lithium-ion battery, which Newman (the DFN model), and Doyle, Fuller, devised, is based upon porous electrode theory and concentrated solution theory [19, 164]. An electrochemical model can be an accurate and reliable candidate for the model-based design of battery management system (BMS) [19, 165]. A single-particle model (SPM) is set up following  to generate an reliable and straightforward electrochemical model of a battery . The model captures most of the electrochemical reaction inside the battery, is more reliable than the equivalent circuit models, and has a simpler structure than the DFN model . The single-particle model of a lithium-ion battery includes fewer parameters than the DFN model, though it is time, which consumes and complex to pinpoint all the parameters in the model . Initially, a single-particle model, which explains the electrochemical attributes of a lithium-ion battery, is set up based upon the electrochemical reaction mechanism . The single-particle model is simplified employing the volume-average integration technique and the three-parameter polynomial approximation technique . Through the BFOA, the parameters characterizing the electrochemical attributes of the single-particle model are identified . Dynamical models of the battery pack could be a useful tool to design these estimators . In the scientific literature for this sort of batteries including purely electric models  or fuzzy models , or electrochemical models [169, 170, 171], some models exist . An extensive analysis on Li-ion batteries modelling is devised in [20, 172]. Fractional order models, models that could be explained by fractional differential equations [173, 174], are devised . These an strategy makes it possible to convey the parameters of the simplified model as a function of the electrochemical and dimensional constants of the lithium-ion cell . That model has an crucial physical meaning, unlike purely electric models devised in the scientific literature . The introduction of fractional differentiation that enables to characterize many parts of the model with a small number of parameters again directly linked to the electrochemical parameters of the battery is another interest . That last model is utilized to design a State of an aging estimator and Charge (SOC) . A solution is devised to conceptualize if the model parameters adjustment is needed as because of aging model and cell behaviour discrepancy . There are also various explanations for disagreements among discussed models : the specific experimental conditions and the dependency of delithiation/lithiation kinetics and stage compositions on the morphology, the particle size, and physical properties of the LiFePO4 material, which is researched to name a handful . The “many-particle” model had been introduced by Dreyer and others [176, 177], which posits that equilibrium potential of LFP material is a non-monotonic function of lithium concentration and lithiation/delithiation of particles happens randomly . Farkhondeh and others devised a mesoscopic model  to circumvent this limitation of quasistatic operation of the LFP electrode and to incorporate a mechanism for mass transfer/phase transition within individual particles . In Safari and Delacourt ’s RR model introduced to emulate LFP, Delacourt  and Safari presumed four spherical particle groups with various electronic connectivities to the conductive matrix though with the identical particle size . They are still not ideally suited to performing tedious researches including ageing and battery pack level simulation and examine the cycling conditions even though VSSD and RR models appear satisfactory methodologies to emulate the inferior electronic electrical conductivity of LFP and the slow solid-state Li ion transport . Aiming at introducing a straightforward model to take into consideration the resistive reactant characteristic of LFP, Marcicki  combined his simplified lithium-ion battery model with a resistance; this resistance differs linearly with the depth of discharge (DOD) . His modelling results indicate a satisfactory concordance when compared to experimental data derived from a cylindrical graphite/iron phosphate cell for a variety of galvanostatic discharge experiments from C/3 to 4.8 C. Nevertheless, there is also a need to investigation the resistive reactant effect of LFP in the entire fraction of discharge/charge curves of a Li/LFP cell . The microstructure of the optimized electrode gives rise to increasing surface area, shorter lithium-ion transport pathways, collectively resulting in a significant enhancement of the battery performance [181, 182, 183], and enhanced inter-particle active material relationships . LIB models that characterize electrode structures are grouped into four distinct groups: (1) models that characterize electrodes comprising of homogeneous single-sized spherical particles [164, 184, 185]; (2) models that characterize electrodes consisting of multi-sized spherical particles [186, 187, 188]; (3) models that employ sophisticated mathematical techniques to emulate electrode structures [189, 190, 191]; (4) models that reconstitute real electrode microstructures employing two imaging techniques of X-ray tomography (XCT), which is computed, and focused ion beam-Scanning electron microscopy (FIB-SEM) in the scientific literature . The group (4) model which employs reconstruction of real electrode morphologies has been made possible with recent advancements in 3D imaging technologies . Several groups have devised models to predict LIB performance, which is based upon real 3D electrode microstructures . That the distribution of lithium-ion concentrations, global polarization, which XCT-based electrode model obtained, and current density, were substantially various from those of 1D single-sized spherical models had been demonstrated by Yan and others [22, 192, 193]. The 3D electrode morphology, which employs nano-XCT, had been reconstructed by us, whilst for macro-scale, the galvanostatic discharge behaviour had been simulated by utilizing Newman psedudo-2D model [157, 158] and the homogenization theory for the micro-scale model . The multiscale model included the real 3D morphology of the electrode and had been an amelioration over the Newman pseudo-2D model, while the present RVE model is an advancement over the single-particle model [194, 195]; this model enables the formation of a computationally effective conceptual framework for such as reconstructed 3-D morphology of the electrode . There are some useful research works on prognostics and the battery degradation modelling for battery SOH estimation [196, 197] in recent decades . In the SOH estimation of battery, in which the empirical degradation models are frequently utilized to develop the dynamical system equation, Stochastic filtering methodologies including Kalman filtering , extended Kalman filtering [199, 200], Bayesian filtering  and unscented filtering are extensively devised . Some methodologies have been devised including the Dempster-Shafer theory for battery SOH estimation and RUL prediction  and a prognostic algorithm, which is based upon a Bayesian Monte Carlo technique . Liu and others  utilized the Gaussian process regression (GPR) to carry out SOH prediction for lithium-ion battery, where the degradation trends are learnt from battery data sets with the combination of Gaussian process functions . A new strategy to lithium-ion battery SOH estimation is summarized via the integration of particle filtering and the MGP model learning . The devised technique comprises of two stages, and the first is the MGP is utilized to learn the statistical properties of the degradation model parameter, which integrates training data sets from unclear battery conditions . Following the parameter distribution information for the degradation process, particle filtering is exploited to derive the battery SOH estimation . In two points, the contributions of the present study could be presented: the first is a fusion prognostics conceptual framework for the lithium-ion battery SOH estimation is devised by combining the degradation conditions from various batteries, the second is the devised algorithm implements distribution, which learns for the multimode process under uncertainty . The lithium-ion and NiMH batteries have a considerable potential for a greater efficiency HEVs . A big advancement in HEVs necessitates to generate novel designs capable to incorporate the lithium-ion battery technologies with vehicles engines of high efficiency, as is noted in [24, 204]. The lithium batteries design must be congruent in conformity with the international standards specs for “vibration, shocks, temperature effects, acceleration, crush impact, heat, overcharge and over-discharge cycles, and short circuit”, as is discussed in [24, 204, 205]. A lithium-ion battery cell has a short term life because of the inside presence of physical transformations that affect significant its electrical performance  or the undesired irreversible chemical . The Li-Ion battery SOC remains one of the main operational condition battery parameter, which BMS monitored tightly, though it can not be assessed directly . The reason for this model selection is to profit of its simplicity and its ability to uncover reliably the whole dynamics of Li-Ion battery, and to be implemented readily in real time with satisfactory variety of performance . Extensive simulations undertaken in MATLAB R2017a simulation environment demonstrated that this electrical circuit model is comparatively reliable to uncover the principal dynamic circuit attributes of a Li-Ion battery cell, including the open-circuit voltage, transient response, and terminal voltage . The NREL Li-Ion battery model, which is integrated in ADVISOR MATLAB platform, is a Li-Ion battery model 6 Ah and nominal voltage of 3.6 V generated by the corporation SAFT America, as is discussed in [24, 205, 206]. Batteries are the prototypical easily accessible storage device, and Li-ion batteries are among the most helpful because of low rate of self-discharge  and their high energy density . In tools ranging from cell phones to electric vehicles, Li-ion batteries are observed and will continue to remain crucial for these and other energy storage applications in the future . That work examines how Li-ion batteries could be utilized to transform mechanical work into electrical energy, a property; this property has not been examined in detail . Previous work on battery electrode mechanics has examined how strains and utilized emphasizes can affect electrochemistry for multiple systems, such as lithium-silicon, sulfuric acid-graphite [208, 209, 210, 211, 212, 213, 214], and lithium-graphite . The results of this earlier research were extended to graphite electrodes, and a straightforward conservation of energy model finds a comparable linear correlation between a corresponding increase in voltage  and utilized strain on a battery . In energy harvesting applications, the coupling between electrochemistry and mechanical strain could be employed . Battery intercalation materials, or “piezoelectrochemical” materials, exploit of the stress-voltage coupling in intercalation materials and harvest energy at exceedingly low frequencies (less than 1 MHz) . Two antiparallel Li-ion batteries linked via an external load were utilized by us to highlight how to harvest small quantities of energy by squeezing one battery [25, 215]. We build a model to then use this model to describe the harvesting system and specify its maximal theoretical efficiency and investigation the process with Li-ion batteries, which harvests piezoelectrochemical . Our model leverages the fundamental coupling between electrochemistry in battery materials and mechanics and could be utilized to other intercalation materials to predict their efficacy for energy harvesting applications . The mechanical integrity of Li-ion batteries has captured the interest of technicians and scientists from the fields of electrochemistry, mechanics, and material science, thereby becoming a hot research topic . Several loading conditions, including indentation [216, 217], radial compression [216, 218, 219], and bending [216, 220], on completely drained Li-ion batteries with low state of charge (SOC), were utilized to imitate real-life loadings to comprehend mechanical-electrochemical behaviours [26, 216, 218, 219, 221]. The qualitative onset of short-circuit criteria had been dictated on the basis of the mechanical behaviours of Li-ion batteries to aid mechanical integrity [26, 216]. Owing to the continuous charge/discharge cycles of batteries, state of health (SOH) of Li-ion batteries and the SOC continually differ, which gives rise to various strain statuses within the cell [26, 222, 223]. That the mechanical properties [224, 225] and volumes  of the active particles change due to differing SOC values had been shown by recent evidences . The qualitative relationship between mechanical behaviours and SOC status were dictated via experiments  to additional reliably characterize and predict the electrochemically reliant mechanical behaviours of Li-ion batteries exposed to abusive mechanical loadings . The coupling effect that induced SOC and SOH and the lifecycle of Li-ion batteries were not regarded . Through choosing 18,650 Li-ion batteries as target cells, the present study analyzes the mechanical integrity behaviour of Li-ion batteries under various SOC and SOH values to bridge this disparity . Governing parameters that describe the mechanical integrity of Li-ion batteries are presented, compared, and examined at various SOCs and SOHs and among various kinds of Li-ion batteries . 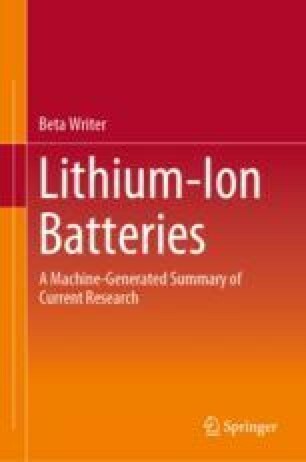 The experimental results on the three kinds of batteries are outlined by forth this chapter . The majority of the capacity deterioration, which is detected in the first lithiation/delithiation cycle of secondary lithium-ion batteries, is because of this SEI layer formation . Previous studies [37, 228, 229, 230] have demonstrated that surface coatings including SiO2 on nanotubes and nanoparticles can enhance the cyclic performance of high energy density electrode materials by stabilizing the SEI layers and minimizing the mechanical degradation . In SiO2 samples, depending upon the subsample configuration (nanoparticle, nanotube, or thin film); electrochemical conditions (charge rates, potentials, or potential sweep rate); and kind of materials in contact (electrolyte and components of composite electrode), a combination of two concurrent reactions, either one reaction, or all possible reaction processes take place simultaneously during lithiation/delithiation . Through numerous other researches [228, 231, 232], they were able to cycle the films reversibly with stable capacities of ~500 mAh/g, implying that the Li2Si2O5 reaction is reversible; this had been revealed . Some crucial questions relating to their mechanical behaviour remain unanswered even though the characterization researches [231, 232, 233, 234, 235, 236] enabled in understanding electrochemical and systemic change behaviour of lithiated SiO2 commodities and the material design efforts [37, 228, 229, 230] caused in innovative core-shell microstructures . That the mechanical properties of electrode materials (both anodes and cathodes) change during electrochemical cycling had been indicated by numerous researches [213, 237, 238, 239, 240, 241]; and similarly, the properties of SiO2 might change continually during the lithiation/delithiation process because of the formation and decomposition of reaction commodities in (Eqs. 1–3), . The primary aim of the present study is to measure the magnitude of emphasizes produced in SiO2 material, additional, comprehend how the variability of mechanical properties affect the mechanics of core-shell kind of particles, and comprehend how these emphasizes differ during electrochemical cycling . Mechanical failure, which emerges from the insertion/extraction of lithium-ions, is one of the principal reasons for capacity deterioration of electrodes  as is well-established . Plenty of scientific literature clarified the mechanism of electrode failure based upon the diffusion-induced strain [28, 243, 244, 245, 246, 247, 248, 249]. Verbrugge and Chen devised analytic expressions of strain within a spherical electrode particle under either potentiostatic or galvanostatic operation [28, 247]. The quantitative trends for isotropic electrode particles could be given by this analysis, though might be an over-simplification for anisotropic electrodes and can not elucidate many experimental results of anisotropic electrode; this electrode encourages us to investigation the impacts of anisotropy and to shed light on something various though significant for battery design or battery application . Regrettably, researches of anisotropic electrodes are still restricted, and the specific impacts of anisotropic properties on the diffusion-induced strain for spherical electrodes have not been indicated . The researched electrodes are posited to be spherically isotropic (i.e., the special case of anisotropy) . The first one is that no experimental data ascertain that spherical electrode particles are all isotropic . The second is the existence of spherically isotropic complete and medium anisotropic electrodes [28, 250, 251]. We, based upon this premise, focus considerably attention on the impacts of anisotropic properties on the diffusion-induced strain inside spherically isotropic electrodes; these electrodes might show many positive signals for anisotropic electrodes in practical application . Our findings indicate that more depth of delithiation (or lower depth of lithiation), which lithiation (or delithiation) followed, is a satisfactory approach to minimize strain and improve battery performance for anisotropic elastic electrodes . It is plausible that the principal results in the present study are instructive for complete anisotropic electrodes . The volumetric change for the silicon electrode is considerably bigger than the carbonaceous anode . That might consequence in substantially high emphasizes and henceforth cracking or delamination of the electrodes [29, 252]. Patterned silicon islands are fabricated as active material , which might avoid the in-plane cracking [29, 254]. The delamination in the interface between current collector and active material still exists [29, 252, 253]. In thin film electrodes, the delamination had been tackled by numerous experimental and theoretical works . The shear-lag model had been utilized by Haftbaradaran and others  to predict the critical size, in which the energy release rate is utilized as the delamination criteria in both 2D and axisymmetric structure . Following the cohesive model Pal and others  revolved around the influence of elasto-plastic deformation in the current collector on interfacial delamination . The evolution of the interfacial delamination has been researched by utilizing the cohesive model under the axisymmetric condition . Plane strain and plane stress are two extreme instances for the 3-D issue of the rectangular plate to many extent . The edge surface of the rectangular plate is in accord with the plane strain condition . The stress/strain conditions in the rest region of the rectangular plate are in many measure between plane strain and plane stress . The plane analysis will be utilized to assess the delamination for the rectangular island electrode as two extreme instances . The volume change of anode electrode active materials can trigger huge emphasizes; these emphasizes can cause damages of the electrode including delamination and crack when the solute atoms migrate to the anode in Li-ion batteries [30, 253, 257, 258]. The stable crack growth in hollow nanoparticles had been studyed by Aifantis and others  spherical electrode . Some literatures have investigated the strain fields of hollow spherical electrode theoretically and experimentally . Yao and others  researched the interlinked silicon hollow nanospheres and indicated that the emphasizes of the hollow electrodes are smaller than that of solid ones . Liu and others [261, 262] established a theoretical conceptual framework to investigation the strain fields in hollow core-shell spherical electrodes, and offered explicit formulations for the emphasizes . The coupling effect between electrochemical reactions and DIS in lithium-ion battery electrodes has not been studied systematically . The process of electrochemical reaction will simultaneously take place when lithium-ions are inserted into the electrode . That relative low rate of diffusion and reaction and the high displacement density can profit stability of solid spherical electrodes and the cycling capacity had been studied by Liu and others [30, 263]. In cylindrical electrodes with the effect of reversible electrochemical reaction, strain and the diffusion had been studyed by Zhang and others [30, 264]. A novel model is established to examine the DIS with the effect of electrochemical reaction-induced strain and investigation the coupling effect from the following three facets: (1) which computes reaction-induced strain in various spherical electrode on potentiostatic charging operation, (2) comparing the coupling effect of DIS the DIS and electrochemical and electrochemical reaction-induced strain in hollow and solid sphere, and (3) examining the DIS and electrochemical reaction-induced strain with the various thickness in the hollow spherical electrode . Lithium-ion batteries have been commonly used as rechargeable power for electric vehicles for the big advantages of light-weight and its high energy density . More and more electric vehicle fire accidents induced by lithium-ion batteries have been indicated, and the safety performance of lithium-ion battery has aroused considerable attention as the explosive growth of electric vehicle, which is equipped with lithium-ion batteries . The serious damage of a lithium-ion battery can consequence in an internal short circuit condition, which follows a thermal runaway . It is required to investigation the response of the lithium-ion battery under mechanical loading in order to lessen the risk of catching fires in electric vehicle crash accidents . Sahraei and others [217, 218, 220, 221, 265] carried out a set of loading test on various kinds of lithium-ion cells and devised homogenized model which captured the short-circuit point reasonably well . Choi and others  undertaken various types of mechanical tests to investigation the response of lithium-ion pouch cells, examined its mechanical behaviour toward stress rate, temperature, and anisotropy . All of those literatures discussed before are primarily concentrated on the examination of mechanical properties on lithium-ion battery cell level, and most of these test conditions are quasistatic . Ceramic materials are one of the principal groups in the Materials Science by reason of their applications in modern life . There are numerous techniques of preparation including chemical technique, which comprises sol-gel and hydrothermal process, and mechanical technique, which comprises solid-state reaction . Ceramic materials, alkaline-earth-metal pyrophosphates, with the general formula A2MP2O7 (A = Li, K, Na, Ag. ; M = Ba, Ni, Cu, Zn.) [267, 268, 269], are well established for their potential applications as magnetic and luminescent materials [32, 270]. The theoretical methodologies of transport phenomena at the microscopic level could be undertaken taking into consideration two principal contextual factors: the structure of the compound and the concentration of the ionic species responsible for the transport which could be typified by its ionic radius, its charge, and polarizability . Compound, which is Titled, has been previously investigated magnetic and systemic viewpoint whilst the electrical properties were not indicated . Structural co-ordination of the prepared materials and thermal behaviour were examined, respectively, employing FT-IR and DTA/TGA measurements . The DTA/TGA results yielded two endothermic peaks: An endothermic peak at 571 K is attributable because of the chemical decomposition and releasing of ligands and a peak at 721 K is because of the irreversible stage transition of the compound . Here, we have the interest to present and explore for the first time the dielectric and electrical properties of the Li-ion pyrophosphate compound Li2CuP2O7 as function of temperature, which employs impedance spectroscopy, and frequency for that . Sony Corporation first marketed Li-ion batteries in 1991, employing a carbon-based anode, organic liquid electrolytes solvents (Blomgren ), and lithium cobalt oxide cathode . Specific combinations of nickel, cobalt (NixMnyCo(1-x-y)), and manganese, are utilized as Li-ion battery cathodes to combine their inherent properties of high capacity, huge electronic electrical conductivity, and enhanced electrochemical stability, respectively (Myung and others ), . A transition in the anode material, from traditional graphite to lithium metal, is of paramount importance for increased the energy density of present-day electric vehicles . The majority of the above methods for increased energy density entail lithium metal as an anode, as it retains an exceedingly low electrochemical potential of −3.04 V relating to hydrogen reference electrode, and theoretical specific capacity of 3870 mAh/g, which is nearly an order-of-magnitude greater than the traditional graphite premised anodes (375 mAh/g) (Xu and others ; Lin and others ), . In the second half of the last few decades for usage in Li-ion batteries, lithium metal anodes were actively studied, though did not see commercial success because of numerous problems (Blomgren ; Cheng and others ): (a) Loss of electrolyte because of reaction with the anode surface and formation of a solid electrolyte interface; this interface gives rise to significant capacity fade (b) Formation of dead lithium that does not partake in the electrochemical reaction and can potentially give rise to capacity fade if Growth of dendritic protrusions that can penetrate via the separator and short is excess lithium not utilized (c) the cell (d) Thermal runaway because of internal shorting and subsequent upsurge of the cell Nucleation and propagation of dendritic protrusions during lithium deposition are linked to all of these difficulties . At ca 1 V versus Li+/Li0, utilized electrolytes, based upon mixtures of organic carbonates, undergo decrease mechanisms with the formation of a passivation layer-the solid electrolyte interphase (SEI) . The SEI layer limits additional decrease of the electrolyte and affects some crucial battery parameters including power density and the capacity fade . A spontaneously formed SEI triggers a significant decrease in battery capacity, which is additional deteriorated by subsequent charge-discharge cycles, so the application of a “functional” electrolyte is recommended [34, 276]. These an electrolyte comprises of salt (s), solvent (s), and special functional additives; whereof SEI-forming additives are responsible for rapid creation of an SEI layer and the controlled . Some such researches have concentrated on explaining the decrease processes correlated with SEI formation, primarily for carbonate compounds including VC [277, 278, 279, 280, 281, 282, 283, 284], through a homolytic ring-opening mechanism, and EC, DMC . A greater μ gives rise to a stronger nonbonding interaction with Li+, while weak binding between the lithium cation and the additive fosters mechanisms on the anode and assures rapid formation of the SEI [34, 285]. Han evaluated numerous various DFT functionals with the goal of assessing additive performance by describing the decrease of VC  and EC . The mean exothermic onset temperature had been assessed to be (159.1 ± 8.3) °C . Lithium-ion batteries comprised of cathode materials made of LiNixMnyCozO2 have been shown to display the calamitous attributes of thermal runaway if they rise above the important temperature of (204.8 ± 16.5) °C . Surface coating of self-terminated oligomers with hyper-branched architecture (STOBA) upon cathode materials had been reluctant to deter the uncontrollable thermal runaway under external heating in these lithium-ion batteries . The results of the present study must foster the pursuit of safer lithium-ion battery chemistries; these chemistries display less response to thermal misuse . That review explores the Li-ion battery as the leading electrochemical storage technology, examining its principal elements, namely electrode (s) as active and electrolyte as inactive materials . State-of-the-art (SOTA) anode and cathode materials are studied, stressing viable methodologies towards validity of Li-ion batteries and advancement of the overall performance; existing issues are not overlooked . Liquid aprotic electrolytes for Li-ion batteries constitute a Li-ion, which conducts salt, a mixture of multiple additives and solvents . Owing to its role in a given cell chemistry and its complexity, the most fruitful, element for additional amelioration of Li-ion batteries, including electrolyte, besides the cathode materials, is identified as most prone . The advantages and shortcomings of SOTA lithium battery systems are emphasised by this overview, aimed to motivate scholars to carry forward and bolster the research towards advanced Li-ion batteries, tailored for specific applications . Confinement tests are implemented for assessing exothermic behaviours of eight non-lithiated or delithiated cathode materials mixed with ethylene carbonate (EC); these materials are widely used in lithium-ion batteries . Eight delithiated and non-lithiated cathode materials, namely lithium cobalt oxide (LixCoO2), nickel oxide (NiO2), lithium nickel oxide (LixNiO2), lithium nickel cobalt oxide (LixNi0.8Co0.2O2), manganese oxide (Mn2O4), cobalt oxide (Co3O4), lithium manganese oxide (LixMn2O4) and iron phosphate (FePO4) are mixed with EC under a programmed rate of heating, respectively . The ranking of thermal stabilities of delithiated cathode and non-lithiated materials with EC is compared and outlined . Safety problem, which regards lithium-ion battery, remains to be a fight even in the near future . At least quite small exothermic peaks can be detected by DSC [43, 44] for both LiFePO4 and FePO4 with electrolytes . Not just the stability of the structures themselves though also the complex reaction processes between electrolytes responded with lithiated cathode materials caused in the exothermic behaviours . Through heat and mass transport in the porous electrodes, electrochemical phenomena including thermal management of Li-ion batteries are substantially shaped . Direct numerical simulation (DNS) is utilized by present chapter to assess the species transport via the composite electrodes of Li-ion batteries . Through confinement tests, 18650A Panasonic and 18650B lithium-ion batteries at full-charged state are carried out to run via thermal runaway . The majority of the maximal temperatures within the batteries under thermal runaway surpass both 800 auto-ignition and °C temperature of organic carbonates to ignite the flammable vapors of the electrolytes in the air . Under thermal runaway, the calamitous attributes must be carryed by Panasonic 18650A and 18650B lithium-ion batteries if they rise above the important temperature of (188.0 ± 4.4) °C . Averaged enthalpy change, which thermal runaway of a Panasonic 18,650 lithium-ion battery induced, is similar to the equivalence of heat released by 0.71 g of gasoline under combustion . The knowledge on the battery combustion behaviour is restricted . The fire hazard of lithium-ion batteries must be regarded to increase the safety margin . An experimental investigation of various configurations: horizontal 4 × 1, horizontal 2 × 2 and vertical 2 × 2 lithium-ion batteries fire behaviours had been carried out . The mass deterioration rate, heat flux and heat release rate were utilized to examine the combustion behaviour, which is thorough more . The mass deterioration, heat flux and heat release rate were assessed . Lithium-ion batteries are burning with potentially deadly explosions and volatile . For the first time, the gassing behaviour of one of the main marketed cathode materials, namely Ni-rich Li1+xNi0.5Co0.2Mn0.3O2 (NCM523 with 0.01 < x < 0.05), is indicated . The generation pattern of the most characteristic gases CO2, H2, C2H4, and CO during 30 cycles by means of differential electrochemical mass spectrometry, which is combined with Fourier reshape infra-red spectroscopy, is examined by us . We monitor its gas, which is potential-resolved, evolution and assess the total quantity of gas from cycle to cycle in a longer-term test of an NCM523/graphite cell . Through combining total and the spectrometric gas pressure data, an explanation on the feature elements of pressure versus time curves during cycling is given . Through a cone calorimeter, many tests were carried out to have a better understanding of the thermal behaviours of lithium-ion batteries (Li-ion batteries) under overcharge and discharge conditions . Various parameters were assessed including the battery surface temperature, voltage, the time to thermal runaway, the time to maximal temperature, total heat released and heat release rate . The current treatment (discharge) can accelerate the warming up, lessen the heat released, and consequence in previous thermal runaway . Overdischarge (overlithiation) effect on electrochemical parameters of lithium manganese spinels of various origin is researched . In reduced and recommended potential ranges, charge/discharge tests for 240 cycles are carried out . Insertion of lithium-ions into spinels by declining potential to +2.4 or +1.5 V against Li/Li+ is observed to give rise to the formation of the overlithiated Li2-x Mn2O4 spinel stage . Repeated cycling, which entails the low-potential areas, deteriorates electrochemical parameters: specific capacity decreases and cell resistance increases . The microsized BE-30 (NEI) subsample better tolerates cycling at reduced potentials . That might connote that at least half of the gram equivalent of extra lithium-ions could be electrochemically inserted into the 16c voids in the spinel structure, which results in the Li1.5Mn2O4 compound this compound is able to reversibly work within the 2.4–4.6 V potential variety; this compound is able to reversibly work within the 2.4–4.6 V potential variety . Manganese ions share these identical oxygens, so that a subsequent increase in Mn–O ionicity must be detected . That even small overdischarge is completely unacceptable for the MTI and JDEES samples is shown by comparisons . A new technique, which is based upon mass spectrometric detection (GC-MS) for the quantification of organic carbonates in cell culture materials and liquid-liquid extraction with subsequent gas chromatography separation, is summarized . The approach had been utilized to cell culture models incubated with commercial Li-ion battery (LIB) electrolytes to gain more insights into the potential toxic impacts of these compounds . The stability of the organic carbonates in cell culture medium after incubation had been investigated . The stability of EC and EMC in cell culture medium had been examined, and the transfer of EMC, EC and DEC across the blood-CSF barrier had been examined . It can be demonstrated that a transfer of organic carbonates into the compartment, which faces brain, took place in a porcine model of the blood-cerebrospinal fluid (CSF) barrier . The character of the subsample matrices might have a significant impact on the outcome  in qualitative analytical analysis . The main aim of this review is to underscore the recent advances in the development of advanced electrolytes for enhancing the cycling stability and rate capacity of LiNi0.5Mn1.5O4-based batteries . An insights into the future research and additional development of advanced electrolytes for LiNi0.5Mn1.5O4-based batteries is outlined . The effect of excessive COV on the discharging ability of cell, and the use of a new non-destructive technique to assess if the damage, which the excessive COV made in the cell, is rendering the cell from additional safe usage or it is still satisfactory with minor degradation in validity and safety, offering a basis for quality consideration of the cell is demonstrated by this work . The technique allows battery manufacturers to pinpoint the internal elements for their cells that are most susceptible to the excessive COV so that quality amelioration of their batteries could be generated and designed . That technique alerts electric vehicles user on the hidden safety problems of battery manufacturers’ battery pack, and allows battery management system to carry out validity balancing, a novel patented method to assure the accurate and safe operation of battery pack . Upon longer-term storage, the first cell is investigated, traces of side reactants are observed around the centre of the anode electrode, and in which case a void space, probably a gas bubble, is detected around the Ni tap in the cell . That cell is compared with a swollen cell, in which, according to the CT results before and after gas removal, gas is observed inside the space between the can body and the jelly roll and inside the jelly roll, which is investigated after undergoing numerous cycles after longer-term storage . The gas bubbles are demonstrated by the results and side reactants produced as a consequence of longer-term storage are dictated to be responsible for the swelling in the cell because of prolonged cycling . At elevated temperatures and room, cycle-life tests of commercial 22,650-type olivine-type lithium iron phosphate (LiFePO4)/graphite lithium-ion batteries were carried out . A number of nondestructive electrochemical methods, i.e., capacity recovery, which employs a small current density, differential voltage and differential capacity analyses, and electrochemical impedance spectroscopy, were carried out to infer the degradation mechanism of these batteries . We disassembled the batteries, and material analyses were carried out to additional describe these batteries’ internal materials . Disposal of huge quantity of spent lithium-ion batteries will cause will generate waste management issue including adverse environment influence . Use of Extracted metals from recycling for manufacturing of cathode active material, i.e., lithium cobalt oxide will help in reducing the rate of overexploitation of these useful metals . Recycling process comprises of peeling, extraction steps, and break-up . Variations of parameters for improving the peeling and the break-up steps along with extraction of cobalt oxalate and manufacturing of lithium cobalt oxide have been researched here . The extraction efficiency of cobalt oxalate is observed to be 91% with purity of 90% . The purity of manufactured lithium cobalt oxide is observed to be 91% . Owing to the heat pipes’ transient conduction, fluid dynamics and stage change during cooling/heating with high frequency charging/discharging of batteries, it is important to examine in depth the experimental dynamic thermal attributes in such complex heat transfer mechanisms for design of a BTMS and more reliable thermal analysis . The use of ultrathin micro heat pipe (UMHP) for thermal management of a lithium-ion battery pack in EVs is examined by experiments to show the cooling/heating attributes of the UMHP pack . That heating films stuck on the fins of UMHPs brought about adequate high heating efficiency comparing with that stuck on the surface of cells under the identical heating power is revealed by experimental data, though has less cost for the BTMS and more convenient maintenance . The experimental dynamic temperature attributes of UMHP which is observed to be a low-energy and high-efficient consumption, which cooling/heates technique for BTMSs, could be carried out to guide thermal analysis and optimization of heat pipe BTMSs . A probabilistic battery design technique is outlined, with reference to lithium-ion batteries, based on linked economical facets and battery life-time . The reliance of battery life-time on various parameters, including operating environment and design maximal specific power is taken into consideration by the technique . A probabilistic technique for battery design is devised which assures the minimization of a useful cost function which has the supposed life-time as a basic input after a detailed statistical data analysis . The technique enables to assure the needed robustness design against the random differences in specific power experienced by a Li-ion battery, which is designed for a small electric bus (public transport service) . The dynamic and steady-state behaviour of battery is mimiced by the model . Internal charge distribution of the battery is modelled employing two RC circuits . Self-discharge feature of the battery is modelled employing a leakage resistance . The internal voltage source of the battery model differs dynamically with SOC to replicate the experimental terminal voltage attributes of battery . The internal voltage CVS is accomplished as a second-order polynomial function of SOC to retain the simplicity of model including to reliably portray the terminal attributes . This chapter aims to characterize a single-particle model of a lithium-ion battery that has a straightforward structure, could be enmeshed in simulation computer program for on-line applications, and offers a high-accuracy characterization of the dynamics . A simplified electrochemical model that underlies the dynamic voltage response is the single-particle model; this model is explained by a set of partial differential equations . The single-particle model is simplified employing the volume-average integration technique and the three-parameter polynomial approximation technique . A protocol for reducing the model, which is based upon the volume-average integration technique and the three-parameter polynomial approximation, is devised to simplify the partial differential equations of the single-particle model . The single-particle model of a lithium-ion battery is set up in Simulink and MATLAB . Comparing the terminal voltages of the model and the battery, the accuracy of the single-particle model is ascertained . That the single-particle model of a lithium-ion battery is straightforward and quite reliable, verifying the validity of the parameter identification process is demonstrated by the results . In the pack, the BMS employs models of every cell to undertake an reliable battery diagnosis . A two fractional models of lithium-ion cell are devised . The quite low number of parameters in the simpler devised model allows a two fractional models of lithium-ion cell’s adjustment with a quite straightforward protocol . A solution is devised to conceptualize if the model parameters adjustment is needed as because of aging model and cell behaviour discrepancy . Following the meager inherent electronic electrical conductivity elements of LFP, an empirical variable resistance strategy is devised for the single particle model (SPM) . Through the increasing ohmic resistance, a resistive-reactant characteristic of LFP as the positive electrode active materials, the increased resistance behaviour, which is detected at the end of discharge process of LFP batteries, could be justified . “Schematic of the coated LFP active material particles in (a) beginning of discharge with well-connected particles, (b) end of discharge with poor-connected particles” . A novel model that keeps all main advantages of the single-particle model of lithium-ion batteries (Li-ion batteries) and comprises 3-D structure of the electrode had been devised . A small volume element of an electrode, called the representative volume element (RVE), which constitutes the real electrode structure is regarded by this model unlike the single spherical particle . The advantages of employing RVE as the model geometry were shown for a characteristic LIB electrode, which comprises of nano-particle LiFePO4 (LFP) active material . The simulation results revealed that the distribution of lithium inside the electrode microstructure is quite various from the results obtained based upon the single-particle model . The simulation results are in satisfactory concordance with the discharge profile of LFP cathode at multiple discharge rates; these rates have been validated with experimental data . Under unclear conditions, where the degradation process parameters distribution could be learnt from the various readily available capacity measurements, a new integrated strategy, which is based upon a mixture of Gaussian process (MGP) model, is summarized for lithium-ion battery SOH estimation . Through fusing the training data from various battery conditions with the MGP model, the distribution information of the degradation model parameter is retrieved to uncover the time-varying degradation behaviour . The PF algorithm is utilized to predict the battery SOH by exploiting the degradation model parameter distribution information . The efficacy of the examiner state estimator design is demonstrated via intensive simulations carried out to calculate the state-of-charge of a lithium-ion rechargeable battery, which is integrated in a hybrid electric vehicle Battery Management System structure for a particular Honda Insight Japanese car . The state-of-charge is an indispensable internal parameter of the lithium-ion battery, though not directly measureable, hence an reliable estimation of battery state-of-charge becomes a crucial operation for the Battery Management System . Lithium-ion intercalation materials are also mechanically active even though Li-ion battery research frequently examines electrochemical properties . We build a model to investigation and predict the efficacy of intercalation materials as mechanical energy harvesters . We indicate that a Li-ion battery harvester could be modeled as a straightforward circuit and that we can make both quantitative and qualitative inferences about the efficacy of a battery material, which is given its inherent mechanical and electrochemical properties . Two governing contextual factors that impact the electrochemical behaviours of lithium-ion batteries (Li-ion batteries), state of charge (SOC) and state of health (SOH), are continually swapped, hence impeding the understanding of the mechanical integrity of Li-ion batteries . The electrochemical failure of Li-ion batteries with multiple SOHs and SOCs exposed to abusive mechanical loading is examined by the present study . Comprehensive experiments on LiNi0.8CoO15Al0.05O2 (NCA) LIB indicate that the change trend differs with SOC value and that SOH decrease gives rise to systemic stiffness . Electrochemical failure stress at short circuit has no relationship with SOH or SOC, while failure strain increases with the increase of SOC value . Through monitoring the substrate curvature, which employs a multi-beam optical sensing technique, strain evolution in the SiO2 thin film electrodes during electrochemical lithiation/delithiation is assessed in situ . A straightforward plane stress finite element model of Si nanotube coated with SiO2 shell had been devised to comprehend the mechanical response of the core-shell kind microstructures under electrochemical cycling; assessed strain response had been utilized in the model to constitute SiO2 constitutive behaviour whilst Si had been treated as an elasto-plastic material with concentration reliant mechanical properties derived from the scientific literature . The results indicated here offer insights and qualitative understanding as to why the highly brittle SiO2 coatings are able to improve cyclic performance of Si indicated in the scientific literature and stabilize significant volume expansion (300%) of Si core without fracture . The basic mechanical properties summarized here are required first step for future design and development of SiO2-based electrodes or durable Si/SiO2 core shell structures . The energy density and capacity of current lithium-ion batteries is restricted by electric vehicle and non-conventional energy production technologies’ electrode materials and are not adequate to satisfy the future energy demands . It could be detected that when SiO2 coating is presumed as a pure mechanical clamping layer with elasto-plastic properties , the hoop strain in SiO2 reaches as high as 2.9 GPa, which is substantially greater tensile strain than the fracture strength of SiO2; this strength can give rise to cracking . Mechanical degradation, which pulverization and crack nucleation produced, can give rise to the capacity fade in lithium-ion batteries; this fade has been attributable to diffusion-induced strain inside battery electrodes in recent decades . Not considerably attention has been directly taken to the models of diffusion-induced strain for anisotropic electrodes . An analytical model of diffusion-induced strain for spherically isotropic elastic electrodes under galvanostatic and potentiostatic operation is devised by us . A semi-analytical technique is devised to examine the interfacial delamination in electrodes by utilizing the 2D analysis, i.e., plane strain and plane stress . It is observed that the delamination in the plane stress condition happens easier, suggesting that the constraint is damaging to retain the structure stability . With regard to the obtained governing equations, a formula of the dimensionless critical size for delamination is offered, which is a function of the Poisson’s ratio of the active layer and the maximal volumetric stress . Stress (DIS), which is Diffusion-induced, has been examined in hollow and solid spherical electrode . In a hollow spherical electrode, a novel coupled model is established to examine the DIS with electrochemical reaction . In contrast to strain evolution in hollow and solid sphere electrode, electrochemical-induced strain in solid electrode is considerably smaller than that in hollow electrode . A novel approach is put forth to maximize the reaction-induced strain and the electrode thickness; this strain might eventually expand the overall battery life . Vehicle crashes are one of the leading triggers of catching fires in electrical vehicle accidents, whilst the mechanical intrusion triggered failure of battery which is the most frequent cause of these fires . To lessen the risk of catching fires in electrical vehicle accidents, the crash failure threshold of battery module, which can be provided as an crucial design parameter in CAE analysis of battery systems’ safety, is required to be reasonably well investigated . That influence directions have considerable affects on mechanical attributes, crash failure threshold of battery module, and electric voltage, had been demonstrated by results . Failure stress of separator has been researched that separator under greater stress rate caused in a satisfactory elongation feature of separator and smaller elongation ratio can enhance safety performance of pouch cell under mechanical loadings [31, 287, 288]. XRD and FTIR results, accomplished at room temperature, suggest respectively a pure monoclinic stage with I2/a space group and the hegemonic characteristic of pyrophosphate anion (P2O7)4− . Dielectric and electrical properties have been researched employing impedance spectroscopy complex over a wide frequency (209 Hz–1 MHz) and temperature (576–710 K) variety . The frequency-dependent AC electrical conductivity obeys Jonscher’s universal power law σAC ~ Aωs . Superior energy and low toxicity, power density, and enhanced shelf life have led to the popularity of Li-ion batteries as energy storage tools in the automotive and electronics sectors . Especially greater energy densities will be needed by next-generation Li-ion batteries to satisfy ever-growing demands for longer battery life . Due to low electrochemical decrease potential (−3.04 V relating to H/H+ reference electrode) and superior’s exceedingly high theoretical specific capacity (roughly ten times bigger than that of traditional anode materials), lithium metal is a highly appealing candidate as an anode material for next-generation Li-ion batteries . Stabilization of lithium deposition will be needed by successful commercialization . SEI-forming additives play important roles in lithium-ion batteries, and the crucial to enhancing battery functionality is to specify if, how, and when these additives are lowered . A number of computational methodologies and techniques to specify the optimal way to predict and characterize the properties of the additives had been evaluated by us . A risk concluded to be satisfactory or not is judged from the severity of temperature and pressure under runaway of an 18,650 lithium-ion battery . Maximum temperature above 450° (exceeded the auto-ignition temperature (AIT) C of organic carbonates at the values between 430 and 465 °C) (exceeded 4 times of maximal allowable working pressure, MAWP) and pressure will cause fire and upsurge when a lithium-ion battery goes via an uncontrollable runaway . The following overpressure, which is caused from thermal runaway, is too huge to be tempered or relieved from a rupture disk equipped with lithium-ion battery under such excessive self-heat rate (dT/dt), which accompanys a pressure-rising wave . When under a presumably thermal misuse, when the temperature of the battery surpasses an exothermic onset temperature, thermal runaway is too violent to be stopped by either inhibitor, a pressure relief device, which is installed oligomer for thermal shutdown inside the battery, or by a pressure relief device installed inside the battery . Lithium-ion batteries with the cathode materials made of LiNixMnyCozO2 have been devised to owns the high-rate ability, acquire better thermal stability than that of LiNiO2 or LiCoO2 and maintain the excellent capacity near that of LiNiO2 . Such four kinds of lithium-ion batteries correlated with the cathode materials of LiNixMnyCozO2 pose the highly unacceptable risk of thermal runaway when these batteries are in full-charged states and under external heating with the temperature, which surpasses 160 °C, in the present study . Investigation of the suppression or thermal shutdown of thermal runaway in an 18,650 lithium-ion battery, which is designed with cathode coated by STOBA and made of LiNixMnyCozO2, had been demonstrated to be unclear, not successful in preventing thermal runaway or not good . Research into novel electrode materials to additional increase energy density, power density, safety at affordable cost and cycle life tends . The design and development of novel electrode materials and electrolyte elements based upon understanding of operation and failure processes of the battery, also at the electrolyte/electrode interfaces is crucial to additional advance the limits of cycle life in the LIB and safety, power . The physicochemical properties and attributes of the electrolyte/electrode interfaces formed safety and substantially specify power despite the fact that electrolyte belongs to the group of inactive materials in the LIB . Lithium-ion batteries are not immune to incidents triggered by possible abuses or thermal turbulence . Calorimetry combined with confinement test possessed overwhelming supremacy for evaluating thermal reactive or runaway hazards submerged in lithium-ion battery . A risk is satisfactory or not is judged from the pressure and temperature runaway of lithium-ion battery . Pressure (exceeded 4 times of maximal allowable working pressure, MAWP) and maximal temperature (exceeded auto ignition temperature, AIT) will cause upsurge and fire in batteries, and their assemblies are both unacceptable risks when lithium-ion batteries go to uncontrollable runaway . Through confinement test, ignoring the affects of lithium salt and binder, which is equipped in lithium-ion batteries in the present study, simplified reactive systems between EC with transition metal oxides can be clearly examined . FePO4 is the candidate for large-sized lithium-ion battery based upon the perspective of most reactive inertness, which is demonstrated most, from the relationships of cathode materials with EC . State-of-the-art Li-ion batteries are comprised of porous electrodes in order to increase surface area-to-volume ratio and lead to batteries with better volume-specific and weight-specific energy and power densities . Description, which is Theory-based, enables elucidate some dynamic elements of cell performance had been electroded by Porous . Various solid stages are contained by the electrodes for such batteries, and reliable quantification of electrode properties becomes a quite crucial topic . Confinement test is shown to be an influential method for characterizing the thermal runaway of commercial Panasonic 18,650 lithium-ion batteries . A risk concluded to be satisfactory or not is judged from the temperature and pressure runaway of 18,650 lithium-ion battery . Maximum temperature above 450° (exceeded the auto-ignition temperature (AIT) C of organic carbonates at about 430-pressure and 465 °C) (exceeded four times of maximal allowable working pressure, MAWP) will cause fire and upsurge in batteries, and their assemblies were drawn when a lithium-ion battery went to uncontrollable runaway . Prevention in the induction of thermal runaway from thermal misuse, overcharge, internal short, LiC6 responded with electrolytes below 60 °C is the optimal stratagem in employing lithium-ion battery safely from the runaway processes devised from low to high temperature . The caused repercussions of thermal runaway in lithium-ion battery are unacceptable risks by judging from the maximal temperature, maximal self-heat rate or maximal pressure . An experimental investigation of various configurations: horizontal 4 × 1, horizontal 2 × 2 and vertical 2 × 2 batteries fire behaviours had been summarized . The thorough analysis of the ignition time, mass deterioration, heat release rate, heat flux and released heat offers a comprehensive understanding of the complex fire hazard, which batteries with various configurations induced . Experimental results indicate that the configurations have considerable affects on the burning behaviours of lithium-ion batteries . The batteries of various configurations experienced resemble mass deterioration mechanisms, and the total mass deterioration is comparable, whilst HRR, heat flux and combustion heat are fairly various . H2, C2H4, and CO, are the most characteristic gases in the initial cycles; CO2 is dominating if the terminal cell voltage is increasing . The origin of the SEI forming gases has been identified with separate measurements carried out on graphite/Li cells . In a rather stable fashion, these could be cycled without reconstruction of the SEI when the potential of the graphite anode remains between 0.01 and 0.40 V . Throughout a characteristic battery formation cycle, the gas generation had been examined, as reasonably well . Under overcharge and discharge conditions by means of a cone calorimeter, the thermal behaviours of Li-ion batteries are summarized . Detailed analysis on the surface temperature, voltage, the time to thermal runaway, the time to maximal temperature increased rate, released heat and HRR offers a comprehensive understanding of the thermal behaviours of Li-ion batteries fire . LIB has apparent warming up during discharge due to irreversible heat and reversible heat . The batteries under discharging owns greater heating rates which make them obtain into thermal runaway previous . Discharging will make LIB harder to control and riskier . Apart from, it is observed that overcharge is damaging to the LIB safety that it will make LIB easier to behave considerably more violent when catching fires and obtain into thermal runaway . Four lithium-manganese spinels of various origin, viz., nano-sized stoichiometric homemade (JDEES) material, microsized commercial aluminum-doped (Toda) spinel and two microsized commercial stoichiometric (MTI and NEI) spinels have been exposed to cyclic galvanostatic and voltammetric overdischarge researches for 240 cycles . Intercalation of lithium-ions into lithium-manganese spinels by declining potential to +2.4 or +1.5 V against Li/Li+ gives rise to the formation of the overlithiated Li2−xMn2O4 spinel stage detectable by a feature Li+ insertion/deinsertion peak in the 2.9 V region . No notable transformations of this peak with scan number denotes no changes of the spinel structure, and materials investigated maintain their electrochemical activity in the working region of spinel electrodes, i.e., >3.5 V . An ability to intercalate extra lithium-ions at low potentials substantially depends upon material . Through no more than half gram equivalent, uptake/release of extra Li+ is restricted for other (microsized) samples . Through declining potential to +2.4 V, being electrochemically overlithiated, all samples uptake/release half of the gram-equivalent of extra Li+ . Repeated cycling, which entails the low-potential areas, deteriorates electrochemical parameters: specific capacity decreases and cell resistance increases . That might connote that at least half of the gram equivalent of extra lithium-ions could be electrochemically inserted into the 16c voids in the spinel structure, which results in the Li1.5Mn2O4 compound this compound is able to reversibly work within the 2.4–4.6 V potential variety; this compound is able to reversibly work within the 2.4–4.6 V potential variety . The development of a quantification technique for EMC, DEC, VC and EC in aqueous solutions of cell culture cell pellet and medium solutions had been indicated and organic carbonates as elements of LIB electrolytes were examined in the context of cell culture experiments . The combination of extraction with subsequent GC-MS analysis and an organic solvent demonstrated to be able to pinpoint all feature individual mass traces of the organic carbonates . The stability of EC and EMC in cell culture medium had been examined, and the transfer of EMC, EC and DEC across the blood-CSF barrier had been examined . Organic carbonate solvents were observed to pass is supposed to enter the brain this way in all three examined concentrations and the simulated in vitro blood-CSF barrier . Spinel LiNi0.5Mn1.5O4 material has been regarded as one of the most fruitful cathode material in practical energy application because of its eco-friendliness, low synthesis cost, satisfactory practical capacity of about 135 mAh g−1, and high power capability with an operating voltage of 4.7 V . With regard to the discussion, the fruitful electrolyte additives utilized in high-voltage LiNi0.5Mn1.5O4 cathode ought have the following attributes: (1) the additive can scavenge HF molecules from the electrolyte and form a stable protective film on the surface of LiNi0.5Mn1.5O4, then enhance cell performance a high charge potential without side reactions at the anode surface; (2) high-voltage electrolytes put forward with the solvents must have superior anodic stability . Much feasible solutions must be devised and examined, such as the development of high-voltage solvents (including sulfones, ionic liquids, etc. ), novel lithium salts with high thermostability (including LiBOB), and the creation of carbonate derivatives (including fluorinated carbonates) . Through having it to charge with high COV, we have efficiently identified the seeming gain of Li-Ion cell, and confirmed the hidden problems correlated with charging the cell with high COV, with the use of ECBE battery model, which is devised lately . We are able to offer real-time on-line non-destructive evaluation of the internal elements in a Li-Ion cell to assess its validity and safety relating to this overcharging misuse with our technique . Our technique could be incorporated into existing battery management system so that a more advanced safety technology to assure safe operation of the battery pack with enhanced system validity could be possible . Details of the failure analysis of swelling in prismatic Li-ion batteries after a cycle life and primarily via non-destructive analysis techniques including CT, after longer-term storage and cell disassembly were summarized . The CT disassembly and scans analysis confirmed a void space; this space had been believed to be triggered by gas bubbles, near the Ni tap and exposed to longer-term storage near the edges of the cell, and there were wrinkle-like stripes on the corresponding separators . The CT scans recorded after gas removal revealed between the can body and jelly roll and that gas accumulated between the jelly rolls in the swollen cell that underwent a number of cycles after longer-term storage . The gas bubbles and side reactants produced as a consequence of longer-term storage were dictated to be responsible for the swelling in the cell because of prolonged cycling . The mechanism of capacity degradation in LiFePO4/graphite lithium-ion batteries cycled at 25 and 55 °C had been examined by this work . A series of destructive materials, which underlies nondestructive electrochemical analysis and methods, suggested that deterioration of active lithium had been the principal reason for cell degradation both at 25 and 55 °C, and a greater discharge rate and the evident increase in impedance must be responsible for the sudden capacity fall down at 25 °C . Primarily in the anode, active material downturn at 55 °C happened, even though this phenomenon did not directly give rise to capacity degradation of cylindrical battery . Novel characterization methods should be examined to additional investigation the capacity degradation mechanism of LiFePO4 Li-ion batteries . Recycling of smartphone’s lithium-ion secondary batteries is undertaken employing sulfuric acid as the leachate . The break-up efficiency of the recycling process is enhanced employing multiple optimum operating conditions . 91% with 90% purity of cobalt oxalate is the extraction efficiency of cobalt . The battery grade lithium cobalt oxide is procured lithium carbonate (Loba Chemicals, India) and manufactured from the retrieved cobalt oxalate . The battery grade cathode material must have the purity of 99.5% and consequently additional research is going to enhance the purity of cobalt oxalate and also to extract lithium carbonate from the spent lithium-ion batteries, so that cathode active material could be purely manufactured from metals retrieved from spent lithium-ion batteries . The former is considerably more cost-effective for BTMS with heating films by more convenient maintenance and smaller size . The cost of heat pipe limits its wide application in BTMS due to the use of copper as the wall and wick material and the complicated fabrication process . Given feasibility [35, 36] and the aluminium heat pipe manufacturing, the examination on employing aluminium heat pipe in BTMS could be shown as accurate and efficient way to lessen the cost and weight of EV . A novel technique is exemplified for the optimum design of battery . The statistical elements of life-time and other random variables characterizing the operating conditions, in order to derive an effective estimation of the above life-time distribution are taken appropriately into consideration by the technique . Through the proper combination of a probabilistic strategy for stemming the optimum size of a battery and the statistical analysis of the accelerated test, the core of the technique is constituted . Monte Carlo protocol has been carried out, allowing to derive the statistical elements of the interest variables . That approach could be utilized to the characterization of battery life-time, which incorporates in a proper way the multiple uncertainties engaged in the design . That a full protocol for the design optimization dealt with necessitates the solution of a parameter identification problem for the battery modelling is remarked by the authors . The devised optimum design of battery, by a novel technique which takes appropriately into consideration the statistical elements of the battery parameters, is just a first step towards a deeper series of researches employing non-linear programming methods, including non-linear Kalman Filtering or non-linear least squares . The use the Particle filter technique is worth being devised for probabilistic modeling of batteries: hence it is not bound on prior knowledge about likelihood distributions describing the model of the battery and the technique has the advantage that it is a non-parametric one . The devised lithium-ion battery model employs the elements of both electrical circuit and analytical modelling methods . The model is based upon assessed impedance and BTV attributes . The internal voltage CVS is accomplished as a second-order polynomial function of SOC to retain the simplicity of model including to reliably portray the terminal attributes . To keep the model straightforward mean values of impedance parameters are incorporated . The dynamic attributes of battery are mimiced by the model, with precision . In determining the battery performance, the series internal resistance R S plays a crucial role . It could be utilized as a parameter to assess the health of the battery . Estimating the state of health (SOH) of the battery is important to enhance validity of the vehicle and it is considerably simpler if it is based upon the value of R S . The terminal attributes of battery rely on temperature, as reasonably well . The battery model is demonstrated to match the assessed battery attributes for pulse and constant loading conditions . Through modelling the series resistance R S as a function of battery ageing, future work will entail the battery SOH estimation . “State of charge State of health Open-circuit voltage Battery terminal voltage Controllable voltage source Depth of discharge Internal series resistance of the battery Transient response parameters of the battery Self-discharge resistor of the battery Equivalent or base resistance of the battery Equivalent or base capacitance of the battery Nominal voltage of the battery Cut-off voltage of the battery Nominal capacity of the battery” . An SPM that adequately constitutes the principal dynamics of a battery is established . A BFOA is devised to pinpoint the unknown parameters in the SPM . The results of the parameter identification process are inserted into the SPM, which is set up and simulated in Simulink and MATLAB with LiFePO as an instance . It is ascertained that the results of the parameter identification process are accurate . The single-particle model will be packaged and enmeshed into AMESim to ascertain the effect of the battery on vehicle performance in a future investigation . Fractional models and fractional differentiation are now commonly used to model systems that displays long systems or memory behaviours in which diffusion phenomena occur . Two models for a lithium-ion cell in which fractional transfer functions are utilized and that are inferred from an electrochemical model after numerous presumptions are devised . Owing to the strategy utilized, numerous internal variables in the first model (the most complex), are real electrochemical variable and its parameters are directly associated to the electrochemical and dimensional constants of the lithium-ion cell . A non-linear law (to model the cell open circuit voltage) and the tuning of three parameters is just needed by the second model (the simpler one) . An empirical variable resistance has been added inside a SPM to constitute the increased overpotential specifically observed at the end of the charge/discharge process of a Li/LFP cell . Through taking into consideration the increased ohmic resistance from the resistive-reactant characteristic of LFP, this enhanced the predictability of the SPM model . The electrolyte overpotential can also be a part of this increased resistance; this resistance makes the model ideally suited for charge/discharge rates greater than 1C . A computationally effective 3-D RVE model has been efficiently devised and validated to reliably predict LIB electrode performance at various operating conditions . The model takes advantage of computational efficiency of the single-particle model, whilst simultaneously employing 3D electrode microstructure as the real geometry . A computationally effective 3-D RVE model’s advantages and the demonstration of the model are outlined for a common LIB electrode, which comprises of nano-particle LFP active material . That value is observed to be 1.2×, which is premised 10−14 m2/s on the current model, which is congruent with lately indicated experimental data ranging from 10−13 to 10−15 m2/s, unlike widely used lithium-ion diffusion coefficient that are in the order of 10−19 in spherical particle models . The distribution of the lithium-ions in RVE is shown to be broader than that of the single-spherical-particle model because of the inherent diverse microstructure . A novel model for the battery SOH estimation is summarized based upon the MGP model; this model had been exploited to learn the distribution parameters from various training sets on the various degradation conditions . The initialized distribution parameters could be updated recursively via MGP learning from the current capacity measurements of battery to constitute the density of the degradation model parameters under unclear conditions . Our technique is based upon distribution, which learns from training data, and does not presume any certain state model of degradation parameter, which is normally hard to be obtained in advance . The prognostics for battery SOH estimation under unclear conditions have some issues, as various capacity degradation models with multiple degradation elements can not be obtained in advance . The MATLAB SIMULINK simulation results of the devised AOSE real time implementation in terms of SOC estimation precision, robustness and convergence speed, are fruitful . We examined Li-ion battery materials as mechanical energy harvesters and shown that Li-ion batteries can efficiently be utilized to transform from mechanical to electrochemical energy in addition to storing energy . We typified this process, which employs basic circuit elements, and offered a model and conceptual framework to predict the pertinent energy harvesting parameters including efficiency and peak voltage from basic electrochemical and mechanical data . They serve reasonably well as a prototype for our model and highlight how our model can take raw voltage and expansion data from intercalation materials and predict energy production whilst our commercial Li-ion batteries are not optimal energy harvesters . We dictated that the maximal theoretical efficiency for energy harvesting employing these battery materials is 2.9 ± 0.5% from our model . Real-time strain evolution in planar SiO2 thin film electrodes were assessed whilst cycling against Li foil counter/reference electrodes under galvanostatic lithiation/delithiation cycling . It had been detected that upon lithiation the SiO2 film undergoes compressive strain which increases linearly at low Li concentrations, below 0.4 GPa of strain and 70 mAh/g capacity, presumably representing a linear elastic response of the film . A straightforward finite element model of SiO2-coated Si nanotube (core-shell kind microstructure) had been devised; the SiO2 coating had been modelled employing electrochemical response and strain to be able to offer mechanistic explanation as to how highly brittle SiO2 coatings on Si were able enhance the cyclic performance of Si [37, 38] by sustaining 300% volume expansion for numerous hundred cycles assessed . It had been detected that the maximal strain in the SiO2 coating during electrochemical cycling (i.e., under 300% volume change of Si) is roughly 0.41 GPa, which is less than the fracture strength of pure SiO2 films, offering a plausible explanation as to why oxide coatings survived numerous hundreds of cycles without failure . That observation along with the strain measurements indicates that makes the SiO2 film ductile so that the SiO2 film can maintain huge deformation without fracture, though the addition of Li to SiO2 film not just enhances the film, as they are able to stabilize strain values as high as 3.1 GPa . Insights, observations made in the present study and the results are also helpful (i) to design and build next generation SiO2 coating-based core-shell kind of microstructures for electrodes that are mechanically and chemically stable and (ii) to build a comprehensive electro-chemo-mechanics models of SiO2 films . We have examined the impacts of spherical isotropy on diffusion-induced strain inside electrode particles under potentiostatic and galvanostatic operations and devised the theoretical model of diffusion-induced strain for elastic electrodes with spherical isotropy . The elastic modulus ratio and the lithiation expansion coefficient ratio, which are the feature parameters of the extent of departure from isotropy, have the significant impacts on the diffusion-induced strain . Highlighting the effect of initial condition, we observe that the tangential and radial emphasizes increase with bigger initial concentration; this concentration suggests that extracting more lithium before lithiation (or inserting lower lithium before delithiation) is beneficial to lessen the strain and mitigate the electrochemical properties . It is notable that the strain, because of the initial condition, can not strategy zero even though the concentration is almost homogeneous under potentiostatic operation . Through plane analysis, delamination of the active layer bonded on the substrate had been examined . In both the evolution of the critical time and delamination, the influence of seven crucial parameters, i.e., the length of the active layer, the thickness of the active layer, the electrochemical load factor, the Poisson’s ratio of the substrate and the active layer, the Young’s modulus ratio, and the cohesive strength were assessed . Poisson’s ratio of substrate, cohesive strength, and elastic modulus ratio, have statistically insignificant effect on both the critical time and the delamination process . DIS evolution in the hollow sphere electrode and the solute concentration is examined . In hollow sphere, when compared the DIS in the hollow spherical electrode with that in solid, it is detected that the DIS is smaller . By comparing the DIS in various thickness of hollow sphere, the DIS in hollow sphere is observed that the wall thickness of the bigger hollow sphere, the lesser the influence on the electrochemical reaction-induced strain . Will grow bigger because more surfaces in the hollow sphere; this sphere will bring on the solute concentration and greater changing/exchanging rate . The consequence demonstrates that the electrochemical reaction-induced strain is compressive all the time and grows larger with time increasing . What’s more, the strain in the hollow spherical electrode is considerably larger than that in solid . The reaction radial strain is compressive in the hollow spherical electrode and in the thinner hollow sphere, the strain is larger under the impact of electrochemical reaction . The tangential strain with the effect of electrochemical reaction is considerably smaller than in the solid electrode . The tangential strain with the effect of electrochemical reaction will be smaller with the increasing thickness of the hollow electrode . On lithium-ion battery modules, numerous dynamic influence tests were carried out under various influence directions . That influence directions have considerable affects on mechanical attributes, crash failure threshold of battery module, and electric voltage, had been demonstrated by results . The temperature reliance of s, which is dictated from the fitting of AC electrical conductivity as a function of frequency at various temperatures, is examined in order to comprehend the conduction mechanism in the various stages . CBH model observed to be the OLPT model for the rest of temperature variety (T > 622 K) and the most useful conduction mechanism in the low temperature variety (T < 622 K) . The activation energy, which is computed from modulus formalism spectra and AC electrical conductivity, is congruent with the estimated value from the impedance spectra, suggesting that ion transport is presumably because of the hopping of lithium (Li+) ions . For the first time, an experimental investigation of the ionic electrical conductivity of Li2CuP2O7 had been demonstrated . Following the analysis of ten SEI-forming compounds, we were able to observe the most effective protocol to predict their decrease behaviour . Comparison of basis sets and various techniques revealed that functionals from the Minnesota family, particularly M06-2X, were the optimal devices to characterize the decrease potential . Analysis of popular descriptors confirmed that it is impossible to evaluate the decrease potential, which is based upon straightforward parameters including the LUMO energy in a wide variety of chemical compounds; such screening is just helpful when taking into account compounds; these compounds indicate just small variations in structure . The chemical hardness had been, however, observed to be an helpful property for predicting transformations during the electrode process, even for quite various chemistries . Previous studies on the hazards and incidents correlated with thermal runaway in lithium-ion batteries have been studied by numerous scholars [1, 39, 40, 41]. Previous studies on the hazards correlated with thermal runaway happened in lithium-ion batteries were studied [5, 39, 40, 41].